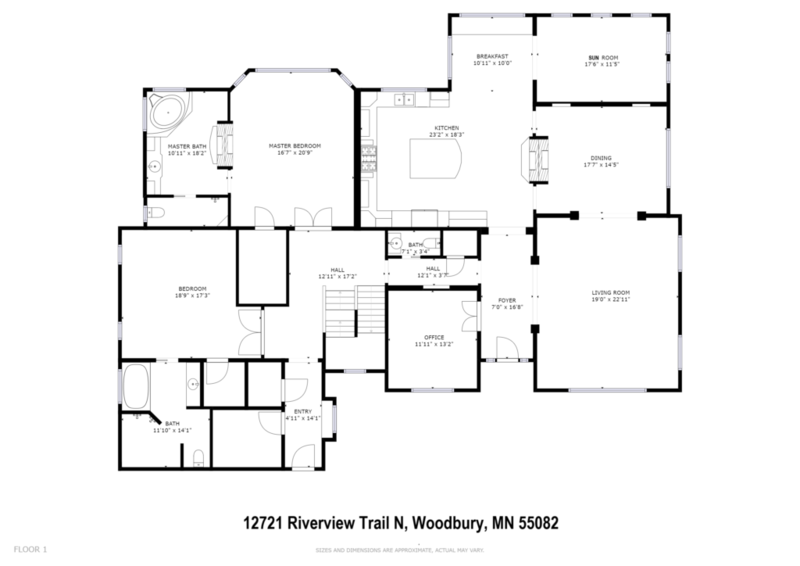 Stillwater, MN – Wheelchair Accessible Luxury Home for Sale! 4 Bedrooms – 4.5 Baths – 3 Car Garage – 5,178 Finished Sq. Ft.
-Additional 3,300 sq. ft. ready to finish on lower level! -Handicapped accessible main floor with wheel chair lift in garage. A charming country estate that ticks all the boxes. A gorgeous Stillwater, MN home with amazing potential and plenty of land for your backyard oasis. Indoors, you’ll find dramatic moments incorporated throughout the home. Breathtaking! Click photo for full listing information. Breathe deeply, take in the glorious prairie landscape. The custom-built executive home offers the luxury you desire with the accessibility you require, in the tranquil setting you crave. A few projects exist inside and out, presenting you with the opportunity to make this home completely yours. The home has been priced with the knowledge that landscaping, driveway, and walk-out lower level require finishing. 4.4 acres. Your land includes 4.4 acres of natural prairie in the desirable Arcola Preserve neighborhood. You will be surrounded by peace and tranquility as you enjoy the sights and sounds of the prairie. Wild flowers and prairie grasses are left untouched on much of the property, with a lush lawn. You will be visited by deer, fox, pheasants, and songbirds. The landscape has been left mostly untouched, providing a blank slate on which you may create the backyard oasis of your dreams! Press> to explore the 3D virtual tour. Turn your device horizontal for best viewing. Elegant country estate. As you drive up to the house, you will get the sense that this home is special. The stone façade reflects the high end features you will find inside. The inviting front porch beckons you for a summer evening’s relaxation. The roof line adds extra interest and an element of luxury, as does the custom, arched windows on the front and side of the home. Fine features for gracious living. The 2-story foyer makes a grand entrance, offering a glimpse into the attention to detail in the design of this home’s interiors. Curved archways in windows and doorways soften the spaces. High ceilings trimmed with crown molding, and stately columns that lend a strong, yet elegant ambiance. Niches are found throughout the home, offering an opportunity to display art or accessories. Dramatic vaults, 2-way fireplaces, and a cohesive design concept add to the wow factor. Each of the four bedrooms has its own full bathroom! Dramatic gourmet kitchen. 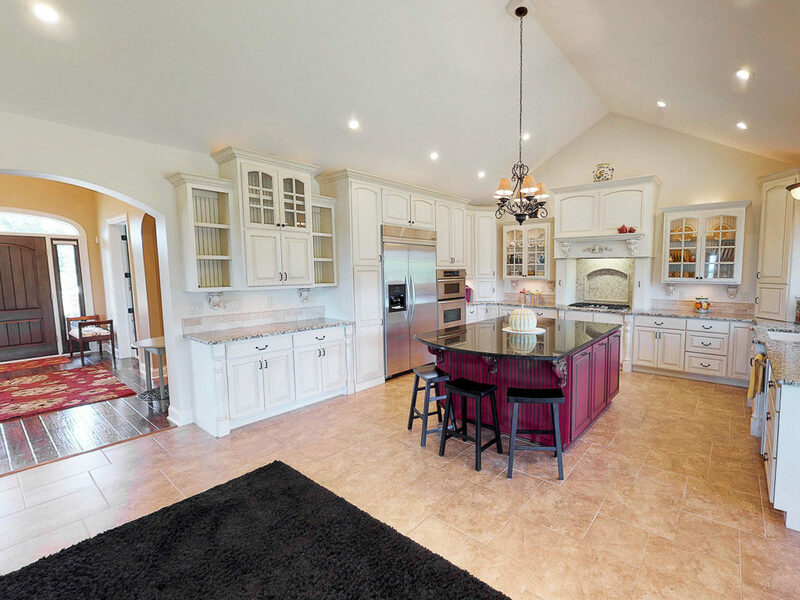 A stunning gourmet kitchen reflects the fine craftsmanship and attention to detail found throughout the home. Dramatic vaulted ceilings, elegant lighting, and 2-way gas fireplace will take your breath away. Creamy white custom cabinetry offers timeless style, with corbels, furniture style legs, glass doors and corbels and are topped with granite. The contrasting island is ideal for entertaining, featuring a breakfast bar, warming drawer, and a hole cut in the center of the countertop for power cords for lighted centerpieces. Stainless steel appliances, radiant heat tiled floors, appliance garages, and plate sorter add an extra touch of luxury. Handicapped Accessible! This home offers TWO large main floor master suites! One offers dramatic features such as a luxurious 2-way fireplace open to both the bedroom and the bath, a bay window, and elegant lighting. The second master suite offers a roll-in shower with spa shower panel. A wheelchair lift in the garage provides easy egress/ingress to the main floor spaces. ROI potential. All the main living areas are finished with the high end features you desire, but the unfinished walk-out lower level is pure potential. The floors already have radiant heat, and rough-ins are in place for a bathroom, as well as electric for a bar and sauna. 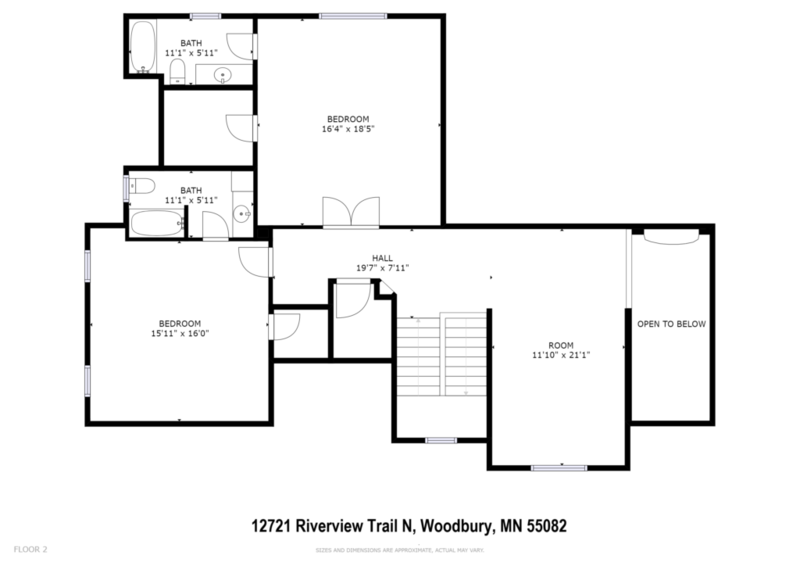 With your creative ideas, the lower level offers 3,300 additional square feet of living space. Great Location! Located north of Stillwater, MN on MN 95. Desirable Stillwater School District #834. Historic Stillwater, MN is a wonderful city in which to live and raise a family! Stillwater, MN is a close-knit community offering all the best features of small town living, while enjoying suburban amenities and a quick commute to downtown St. Paul and Minneapolis. It is a favorite place to settle for those relocating to the Twin Cities to work for companies such as 3M, Ecolab, and Andersen Windows. To learn more about living in Stillwater, MN, watch our video! John and Becky Durham are experts in Stillwater, MN real estate and would be delighted to represent you when you buy or sell a home in Stillwater. Both John and Becky are accredited relocation agents, with vast experience working with families relocating to Stillwater, MN. "John and Becky, thank you so much for all the work you did for us with the sale of our home. We have sold three houses in the last 7 years and have never had agents as professional and motivated as both... continued"